As you wander around the streets of Bangkok, you see the cliches, like ‘don’t judge a book by its cover’ and ‘big things come in small packages’. Many of the small streets- called Sois- are where you find the homes, shops and activities that make Bangkok unique- and great. The small Sois are where you can still find the local way of life, people living in the shadows of the skyscrapers yet leading their life within their own neighborhood and largely unconcerned by what is happening in the skyscrapers. This picture is from a small Soi off the Ari BTS train stop, I’ve been hanging out in Ari a lot, this Soi fascinates me for the amount of activity and business that takes place here. It’s got it all- 2 small ‘shops’ serving up fried chicken, som tam and great Thai food, a man boiling and curing pork to make ‘moo dang’ which is the red pork found a number of Thai dishes, laundry services, apartments and a load of other local businesses. This Soi is a world of it’s own- everyone knows everyone, when the work day is over, you pull a few chairs out front, drink some Leos with others from the neighborhood, pack up the empty bottles, pull down the ‘storefront’ and call it a day. Yep, most people live in back of their business. Note how clean this Soi is, it is completely maintained by the locals, each day and evening the people who live in this Soi are sweeping, cleaning and taking pride in their world. 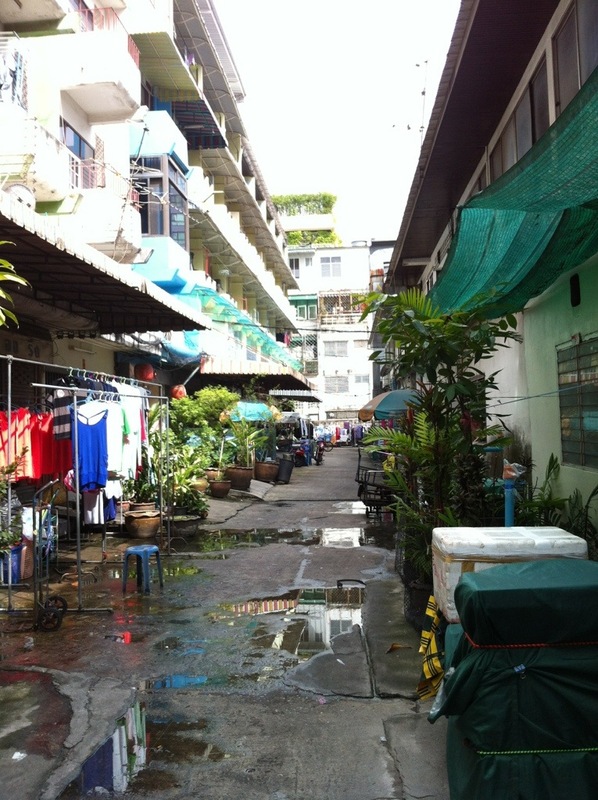 This entry was posted in Bangkok, Culture and tagged Bangkok Soi, Bangkok Street. Bookmark the permalink.